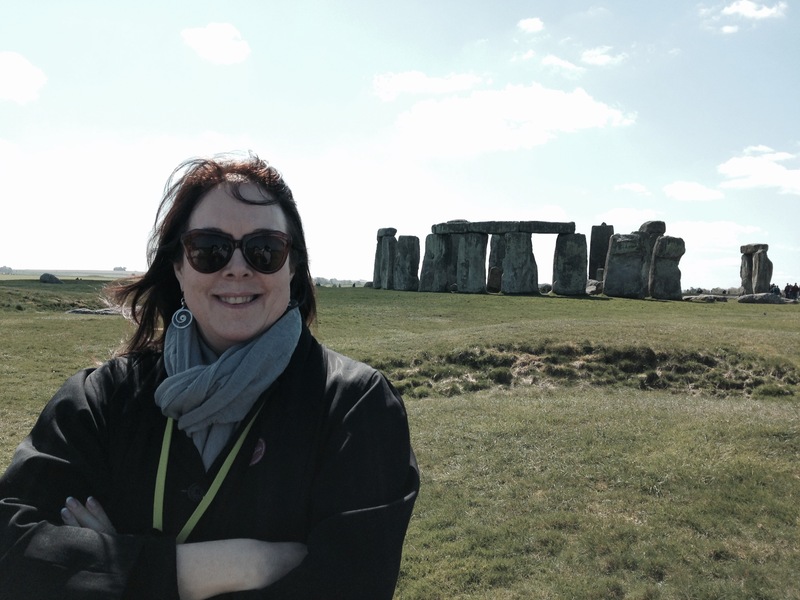 Turns out Stonehenge is a convenient drive from Bath. Admittedly, all of England (not including Ireland and Scotland) is smaller than the state of Michigan, and can be traversed easily in one day. 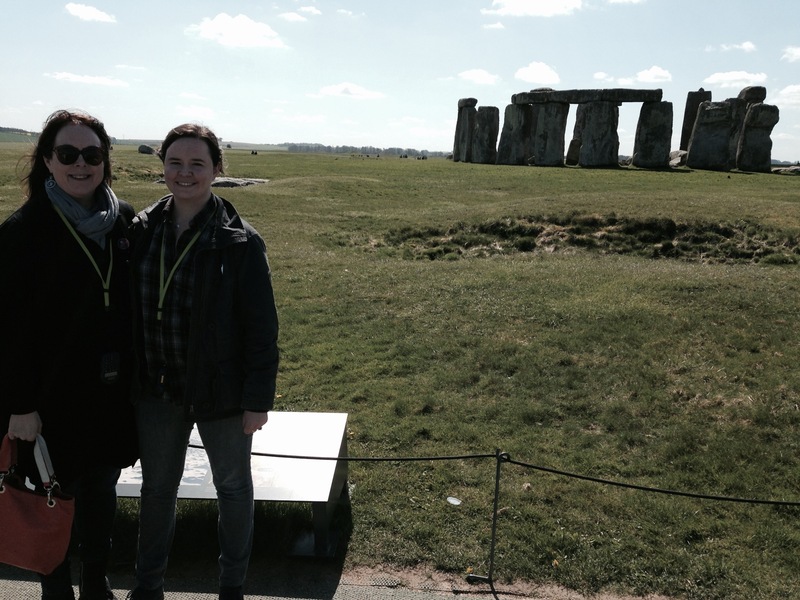 But the ancient site was less than an hour away and we arrived in England with tickets already purchased. On the appointed day, we rented a car and, with Maggie riding shotgun with her iPhone GPS, we wended our way through the countryside. Few if any forests, woods, or even that many stands of trees. They’ve all been cut down long since. No wooden houses (see 3). More hours of daylight (is this a latitude thing?). Fantastic tea no matter where you are (I maybe should have put this as number 1). No disposable plates or cups – even museum cafes serve on ceramic plates and tea comes steeped in cunning little pots. But I digress. 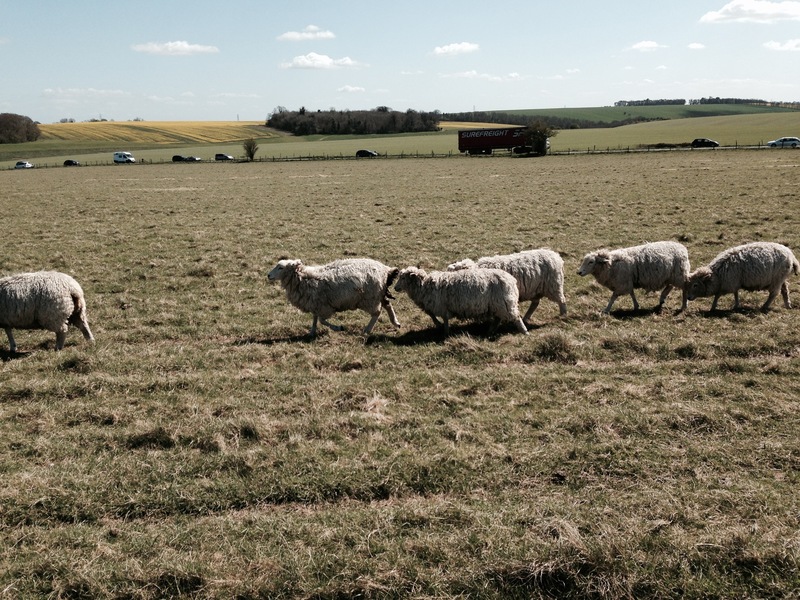 I only wanted to make the point that the drive took us past many sheep, stone and brick houses, grassy fields abutting more grassy fields, or maybe cultivated fields, or fields about to be cultivated, without benefit of trees. Except for the strategically placed picturesque trees that managed to charm us from various spots along the way. Upon parking in the lot at Stonehenge, and acknowledging that Stonehenge and parking lot are truly paradoxical concepts, we retrieved our audio tour thingies, hopped on a trolley and headed to the fantastically old site that promised to be so drenched in history, energy, and spiritual magic that I was already trembling inside, under my breastbone. At first we forgot about the “proper” path to take and the audio tour. Maggie and I clutched one another’s hands (she’d been once before with her program but there is no “getting used to” the place) and walked to the nearest spot we could get to the monolithic stones. I teared up, feeling awesomely moved, and flooded with the spirit of the place. The tourists there that day faded rather quickly into the recesses of my awareness. We collected ourselves after a time, and the three of us went to the first station on the audio tour (I fell in love with audio tours at the Baths and the one at Stonehenge did not disappoint). 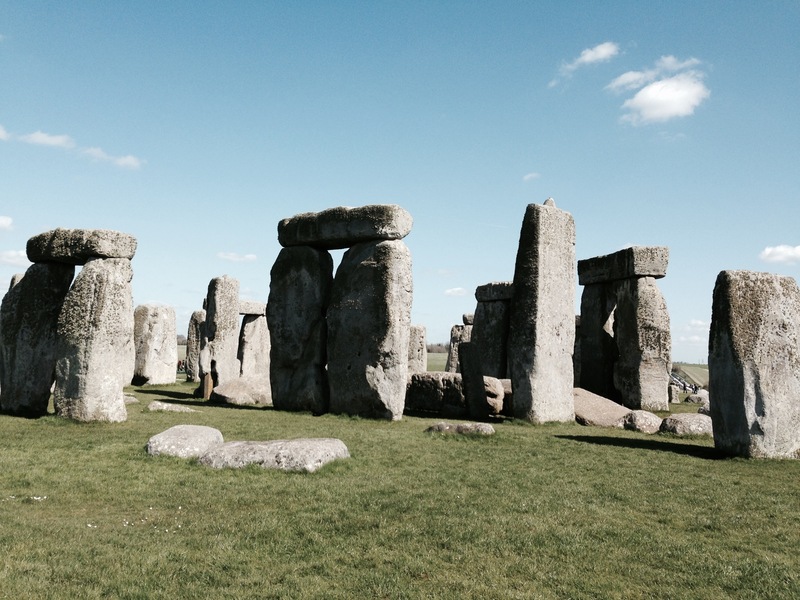 History geeks, we loved hearing all the details about the stones, their origins, the engineering that has been figured out that was mastered by the pre-Celtic folk who built Stonehenge 4500 years ago. 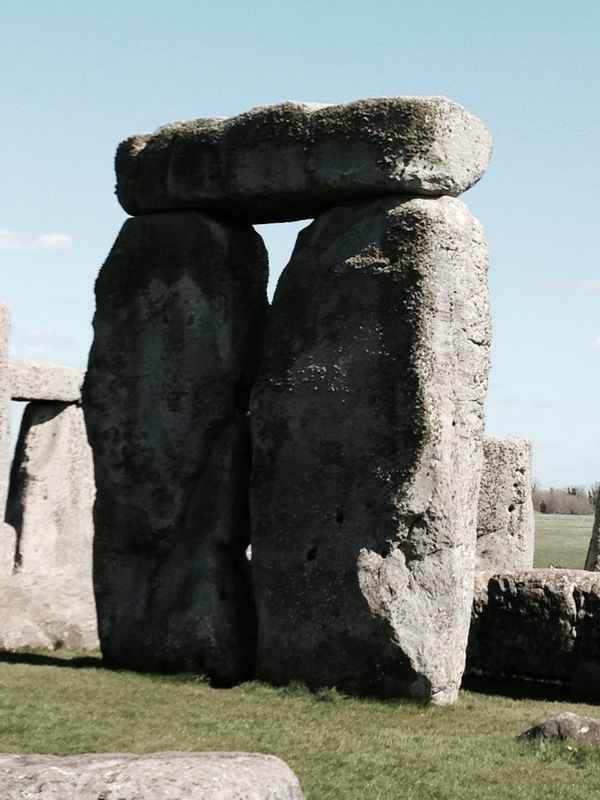 Rising out of the English landscape the way they do, massive and organized, precise yet rough hewn, there is a feeling of inevitability to the stones. They clearly belong there, though they originated many miles away. The astronomy, the engineering, the ancient religion, the very real energy field that surrounds the site, all of it creates awe. Awesome is a word that meant something real that day. My favorite stones. Maybe not as elegant as some more smoothly hewn, these just did something for me. We tried to find a quiet spot to settle as near to them as we could get. We spoke to the spirits who reside there, made an offering, left behind words of intention and gratitude.